I just returned home from the O'Reilly Tools of Change Conference in New York and thought I'd share some of my notes. TOC had a record turnout this year. The conference was sold out with 1,200+ people packed into the Marriott Marquis in Times Square. They had a waiting list of people who wanted to get in but couldn't. A good conference challenges you to stretch your thinking, and on this count the O'Reilly conferences I've attended (TOC, Web 2.0 Summit, Web 2.0 Expo) have never disappointed. O'Reilly has been criticized in the past for using the TOC conference to browbeat complacent publishers on topics near and dear to O'Reilly's heart, such as the evils of DRM (Digital Rights Management). The DRM-will-kill-you theme was less prevalent this year, although Angela James of Carina Press (the all-digital imprint of Harlequin launching this June) struck a more constructive middle ground tone by urging publishers to tip their toes into the DRM-free waters by experimenting with a few titles. Publishers to Get Closer to Customers? One theme this year was how ebooks give publishers the opportunity to get closer to their customers. In the past, big print publishers kept their customers at arms-length. They relegated the dirty work of customer relationship management to the retailers. While this offered publishers the benefit of not dealing with pesky customers and the hassles of ebook customer support, it also caused publishers to lose touch with their customer. This, by the way, was one of my big takeaways from the also-excellent Digital Book World conference a few weeks ago. The always-insightful Richard Nash of Cursor captured my sentiment when in a Q&A at DBW he challenged publishers on an ebook pricing panel to price books based on what customers want to pay, not on a cost-plus basis (where, for example, a publisher might add the cost of their Manhattan high rise office into the calculation of what an ebook should cost). Whereas TOC generally focuses on helping publishers prepare for the future, Digital Book World was squarely focused on the practical here-and-now. Both perspectives are critical and equally important. But back to the theme of publishers getting closer to customers. "Getting closer to customers," can mean many things, though it primarily means selling direct. One advantage of selling direct is that the publisher has an opportunity to own the customer relationship, capture the customer's contact information for later communication/email marketing, build its own community around the books and authors, and cut out middlemen like distributors and retailers. I predict publisher-direct sales, if the practice catches on among publishers, will accelerate the demise of DRM'd ebooks. Why? If publishers become retailers and are forced to communicate with their customers, publishers will quickly realize what a hassle DRM is for their customers. Every time a customer emails the newly minted publisher/retailer with a support question like "the code I'm entering to activate my book isn't working), the publisher loses money just opening the email. When publishers become retailers, they will suddenly further appreciate the valuable audience aggregation and customer service role played by retailers. I love data. The Book Industry Study Group (BISG) presented new data on ebook adoption trends based on a survey of 44,000 consumers (of which, only about 3% were ebook customers), and the results were interesting. Despite all the hype about rich media interactive ebooks, consumers appear to prefer, at least for now, just words on screens, like words on paper. Ebook affordability (lower prices) is much more important to consumers. Ebook customers would be willing to pay more for ebooks if they come with social-media-enabled tools that help them discuss and share the books with others. Men are bigger consumers of ebooks than woman by a narrow 51%/49% margin. Not a huge difference, but a reverse of print books, where women dominate. BISG answered a BIG question haunting large publishers. Will ebooks cannibalize print books? Publishers care, because consumers, on average, pay $6.25 less for an ebook edition they they pay for a hardcover, according to BISG. BISG's conclusion: YES, the 3 percent of people who have moved to ebooks buy fewer print books than before. Publishers aren't yet feeling the impact of this since ebooks represent such a small percentage of the overall book market. Most popular devices for reading ebooks: This is interesting. You might guess, as I did, the Amazon Kindle. Wrong. The most popular device for 47% of customers is their computer screen. Kindle comes in at a close and impressive second place at 32%, followed by 11% for the iPhone, 10% for iPod Touch (note this adds up to 22%, pre-iPad), 9% each for the Blackberry and netbooks, and 8% each for the Barnes & Noble nook and the Sony Reader. The nook percentage is actually quite impressive because the survey data was taken in November before the nook was even shipping. I'm not sure how they arrived at that number. BISG looked at whether or not ebook customers know about or care about DRM. The general conclusion, if I interpreted it correctly, is that most consumers don't know what it is, if you look at the trending data between their November and January surveys, it looks like it's becoming a more important issue for consumers as they learn about it. 28% of consumers say DRM will affect their purchase decision, 34% say doesn't matter, 38% say maybe. Men are more anti-DRM than women (interesting, I'm not sure why this is so). Most popular ebook genres: 31% general fiction, 28% mystery/detective, 25% how-to guides, 21% sci fi, romance 14%. BISG cautioned publishers that their data is dynamic, and suggested they not rush to automatically adjust their strategies to cater to views and opinions of the early adopters, because as ebooks go mainstream the mainstream might have different needs and wants. In my mind, the dynamic nature of the data was fascinating, because consumer expectations are evolving rapidly. You can count on much of this data to be out of date in two months, if it's not already. Fun stuff. Another major theme of the conference was the importance of books and community. Although reading is primarily a solitary experience, readers have always enjoyed talking about books. In at TOC keynote, Arianna Huffington, the co-founder and CEO of The Huffington Post, told publishers we are in the midst of the Golden Age of Publishing. Books don't end with the printed page, she said. "We need to leave behind this idea that old ideas are not worth talking about," she said. "Books are conversation starters and that’s what publishers have the opportunity to facilitate on line better than anyone." My favorite presentation of the conference was from Bob Pritchett of Logos Bible Software, in a session titled, Network Effects Support Premium Pricing. I remember attending his presentation four years ago at the first TOC in San Jose, so I knew I didn't want to miss his presentation this time. They're doing amazing stuff at Logos. Logos faces an interesting challenge, one that every author and publisher faces: How do you compete against free? In their case, they sell about 10,000 bible study ebooks. How much has the bible changed over the last two hundred years? Not much. But what Logos excels at is making this information more accessible than ever before. They take a database-centric view of their vast and ever-growing library of content. When you purchase a book from them, you're not just getting a static ebook, you're buying into a dynamic, integrated online application environment that becomes richer with each new publication, and with each new member to their community. Even if Bible study isn't your thing, check them out for future-of-publishing inspiration. I can't do them justice here. John Warren of the Rand Corporation moderated an interesting panel on the future of digital textbooks. As a preview to the panel, Andrew Savikas and John published an excellent Q&A interview with John's panelists over at the TOC Blog. Access it here. My praise for John's panel, I admit, is not completely impartial. John's a great friend to those of us lucky enough to know him, and the panel included Eric Frank, the co-founder of Flat World Knowledge. Flat World is near and dear to my heart and wallet - I'm connected to them as an investor and advisor. The challenges educational publishers face when transitioning to digital represent a hyper-exaggerated version of the same challenges trade publishers (those who sell through bookstores to consumers) face. Why hyper-exaggerated? Because textbook publishers sell very expensive content, often $100 to $200 per book. The content is expensive for the publisher to develop. The high cost of college textbooks has caused a crisis in higher education because textbook costs now render college education unaffordable to many deserving students, especially at the community college level. Whenever publishers create content for which there is great demand (such as textbooks), yet they make that content prohibitively expensive and inaccessible (textbooks), it causes customers to seek out alternative content options (piracy, used textbooks, etc. ), all of which provide the publisher and their authors no economic benefit. Sound familiar to what trade publishers face? Digital textbooks offer potential relief to students and their parents. The challenge for college textbook publishers is to make the transition to lower cost digital products without putting themselves out of business. I think Flat World is well-positioned for the future of textbook publishing, and I last blogged about them here in August if you're interested to learn more. Educational materials is a content category I want to bolster at Smashwords. At Smashwords, any college instructor anywhere in the world can publish sellable class content. A professor of English literature in India, for example, can publish their book at Smashwords and sell it to students in the U.K. or Australia the next day. How cool is that? There's a Big Market for Books outside the U.S. Speaking of the world, in my extensive one-third decade experience in the book publishing industry (yes, I still consider myself a newbie), it's apparent to me that most American publishers and authors take a U.S.-centric view of the world. Among print publishers and their agents, their focus is to carve up and sell the rights to overseas partners and let them worry about the rest of the world. Yes, the U.S. represents the largest single market for books, but this will change, especially for ebooks. Authors and publishers would be smart to retain global language rights to their books because the Internet moves the world closer to becoming one single market. Billions of knowledge-and-entertainment-hungry consumers are coming online in fast-growing countries like India, China and Brazil. Hundreds of millions of readers outside the U.S. speak and read English. What's my point, and what does it have to do with TOC? Ramy Habeeb, of Arabic publisher Kotobarabia, gave a great keynote explaining both the challenges and the opportunities for publishers looking to tap into the huge market for Arabic-speaking and reading consumers. He spoke about the impact of censorship in large Arabic-speaking countries such as Egypt and Saudi Arabia. Self-censorship among authors, he said, is also a problem, because few authors wake up in the morning thinking, "I wonder how I can get arrested today." Habeeb, himself based in London, sees censorship declining once free market mechanisms enable each country to realize the economic benefits of a thriving book publishing community. Kudos to O'Reilly for providing attendees this other-world view of publishing. A final highlight was Tim O'Reilly's interview with uber-inventor and master futurist, Raymond Kurzweil, the man behind the new Blio ebook platform. He spoke about how most forward-thinking people consider technology progression as linear (steady predictable progress), when in fact some of the most important technical progressions are exponential (progress accelerates over time, catching everyone by surprise). Ebooks are likely an exponential phenomena. They're not a fad, and they may reshape the book market faster than any of us believe. Overall, the conference content was excellent. The biggest gripe I heard was that the conference content had too many paid commercial keynotes. Two publishers from outside the US mentioned this to me as a big disappointment. They paid $1,000+ for admission plus the travel and other expenses, they told me, to access knowledge, not to be forced to endure a commercial announcement. When a stuffed suit gets on stage with a PowerPoint written by some junior PR person, it doesn't go over well. Several attendees vented their frustration on Twitter. O'Reilly isn't the only offender out there. This was also the biggest complaint I heard about the otherwise solid Digital Book World conference I attended last month. One especially egregious vendor keynote was a sales pitch for a company that ships print books on container ships from China (what that has to do with digital books, I don't know). At least O'Reilly's paid advertisements contained better content. Feb 27 update: I cross-posted an updated version of this over at the Huffington Post. Click here for my conference notes for last year's 2009 Tools of Change. 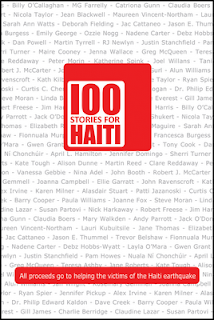 Smashwords author Greg McQueen has organized a great book project called 100 Stories for Haiti. The project came together immediately after the earthquake. After a frantic few days of tweets and YouTube videos, McQueen assembled an impressive list of volunteer editors to curate, edit and assemble a 100-story anthology created entirely by the donated submissions of indie authors from 10 different countries. Smashwords is participating in the project as its ebook publisher and distributor, and will donate 100 percent of the net proceeds directly to the Red Cross. The group plans to release the book on March 4, at which point the ebook version can be purchased at the 100 Stories For Haiti page at Smashwords. The print version will be available from Bridge House Publishing for the price of £11.99 plus shipping fee. Learn more about the 100 Stories For Haiti project at their new official blog at http://www.100storiesforhaiti.org/. I encourage you to scroll through the site and view some of the videos of Greg as his idea sprang to life in real time. His passion is inspiring. This isn't the first time indie authors have rallied together to make a difference. Back in September, Smashwords author Ed Patterson organized Operation Ebook Drop, a non-profit initiative that allows indie authors to donate free ebooks to coalition troops and international peacekeepers. March 4 Update: The book now is out at Smashwords at http://www.smashwords.com/books/view/10591 You set the price. I blogged more about the project over at The Huffington Post. 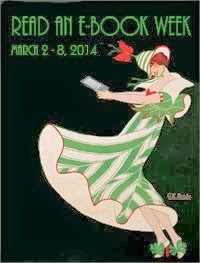 Smashwords is again an enthusiastic sponsor this year of Read an Ebook Week, an international literary event that kicks off March 7 and runs through March 13. The event is dedicated to celebrating the joys of ebooks. Book lovers can join in on the celebration by downloading a treasure trove of deep-discounted ebooks from Smashwords as well as the multiple other ebook retailers and personal author websites offering ebook specials. Like last year, we've created a special RAEW catalog that allows Smashwords authors and publishers to enroll their books in the promotion at discount levels of 25%-off, 50%-off, and free (100%-off!). I expect we'll offer over 1,000 deep-discounted Smashwords ebooks. Participating authors and publishers will benefit from promotion. The special Smashwords RAEW catalog, which goes live March 7, will receive promotion at the top of the Smashwords home page, and will also appear in our Stanza catalog on the iPhone and iPod Touch, and in our Aldiko catalog for Android phones. And last but not least, the catalog will receive promotion at the Read an Ebook Week website. If you're a Smashwords author or publisher, you can enroll your books in the promotion by visiting the enrollment page. If you're not yet a Smashwords author or publisher (why not?? ), visit the How to Publish at Smashwords page to learn how simple it is. Once you upload your book(s), you can enroll in the free promotion. I also encourage those of you with blogs and websites to help promote the event by posting one or more the various promotional banners you find at the RAEW banner page on your own sites. 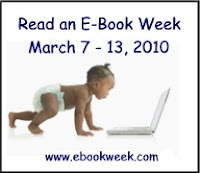 For more information on Read an Ebook Week, visit www.ebookweek.com, or check out the Smashwords press release. Enjoy the great reads and tell a friend! Dan Poynter and I presented our Ebook Revolution presentation this weekend at the San Francisco Writers Conference. Attendees were given a crash course in how to produce, publish, price, distribute and promote their books as ebooks. 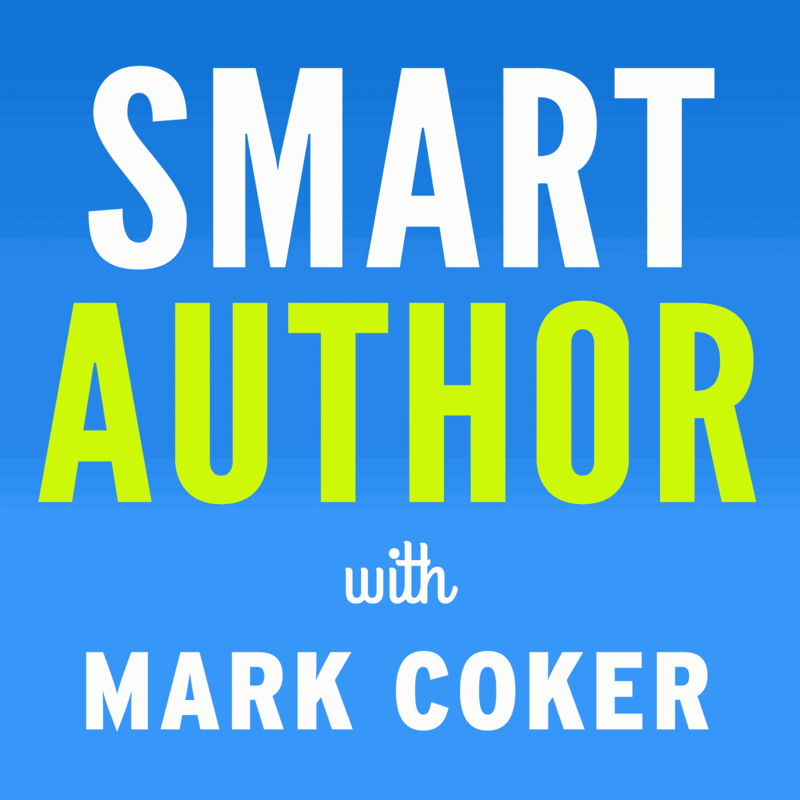 View more presentations from Mark Coker. As promised, I presented *preliminary* data based on a quick study we did at Smashwords to determine if certain ebook price points yield authors and publishers more revenue. For example, we all know if something is cheap, we tend to consume more of it. If the price goes up, we consume less. So how does this rule apply to ebooks, and at what price can ebook authors and publishers expect to yield the highest total revenue, defined by price multiplied by units sold? We examined 13,500 recent sales at Smashwords. We aggregated the sales data into 50 cent price ranges from $.99 and up, and then divided by the number of titles represented by those sales. This gave us the average sales per title per price point. The vertical axis is deliberately left unlabeled because I'm more interested in the visual representation of how titles in different price ranges perform in relation to one another. Scale, however, is apparent in the horizontal lines. The third line is triple the first line, and the second is double the first. I expected to find a single price as the magic sweet spot, but instead, our data suggests there may in fact be a few sweet spots. $5.00 and $9.00, for example, look like promising price points that deserve further study. The highest yielding books, on average, are those with higher prices. Before you all run off and raise your prices over $20.00, I'd caution this data is subject to error and misinterpretation. The data doesn't take into consideration genre, the length of a title, the quality of a title, the age of the title, or the success or failure of the authors' marketing. Although we looked at a large sample, most of these sales were under $10.00 because most Smashwords books are priced under $10.00. Although the data is normalized to account for this, results for titles priced over $11.00 are less statistically relevant because they reflect fewer titles. On the surface, it wouldn't be such a huge surprise that authors and publishers can make more money at $20.00 than $2.00. In order for the $2.00 book to beat the $20.00 book, the $2.00 author would have to sell ten copies for every $20.00 copy sold. 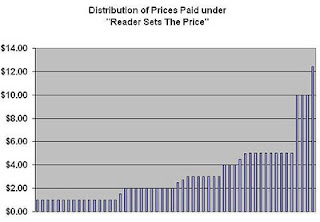 The supply curve isn't so elastic that readers will read an unlimited amount of content at lower prices. A reader's time is limited, and the reader values their time, so it would make sense the reader is willing to invest good money if they know it's for a quality read. The possible lesson here, and it's a bright note for authors with the ability to develop high quality content, is that readers will pay for your content if it's worth paying for. I think the data raises more questions than it answers, so I plan to dig deeper. In the months ahead, we'll look at larger samples and better-tuned sample sets. I'll share the more enlightening results with you here. The conference was excellent, by the way. If you're a writer and you want to improve your craft and knowledge of the business, I'd definitely recommend the conference in 2011. Agents Michael and Elizabeth Pomada, the conference organizers, did an excellent job of pulling together a writing conference that was both entertaining and educational. Thanks also to the dozens of conference volunteers who helped make every session run like clockwork. What Happens When Ebook Customers Choose Their Own Price? One of the pricing options authors and publishers can select at Smashwords is "Reader Sets the Price." 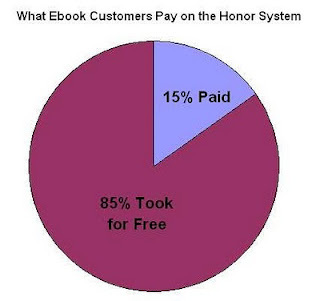 The reader pays on the honor system. They can take the book for free, or they can select a price of $.99 or higher. It's a chance for authors to eliminate price as a barrier in their never-ending campaign to reach readers. We've offered this pricing option since we launched Smashwords two years ago (Hey, today's our two year birthday!). Internally, we always thought of it as Radiohead pricing, since our inspiration for this model was the band Radiohead who bravely offered their album "In Rainbows" under this pricing model in late 2007. At the time, Radiohead had recently unshackled their careers from the control of their record company, and the pricing scheme probably amounted to an equal mix of experimentation, pre-album publicity stunt to drive paid concert attendance and physical CD and vinyl sales, a gift to their fans, and also a big F* You to the record companies. Radiohead never revealed hard data on the percentage of people who paid or the average price paid, though the album did go on to top the charts in the U.K., U.S. and elsewhere. As I mentioned yesterday in my post about the most popular ebook formats, earlier this week we did some number crunching to expose some of the data Radiohead never shared. We looked at a small sample of 353 recent "purchases" under this pricing option at Smashwords. Of the 353 purchases, 299 customers selected to take the book for free and 54 paid money. Next, we looked at the breakdown of the voluntary payments. The payments ranged from the lowest minimum of $.99 to a high of $12.42. The average price paid was $3.20, and the median price (for you statistic geeks out there) was $3.20. As you can see from the chart, the distribution of payment amounts was fairly even. Interestingly, when we compute the average yield per book "purchased," including the zero dollar purchases, it averages out to $.49 per customer. I neither encourage or discourage our authors to use the Radiohead model. As I'll discuss this weekend in my Ebook Revolution session with Dan Poynter at The San Francisco Writer's Conference, there's no one-size-fits-all pricing strategy for ebooks. Your choice of pricing really depends on your objective as an author, and also your subject matter. Are you looking to maximize readership or revenues, or do you want to do both? High prices tend to discourage readership by reducing affordability. Lower prices expand the available market. Free eliminates price as a barrier. And the Radiohead model offers a middle ground by trusting the customer to decide. The other bit of research I'll share at the conference is a small study where we sought to discover the magic price at which an author might expect to maximize earnings. Is the price $1.00 or $25.00, or somewhere in between? Or might there be multiple magic price points? This will be the topic of my next post. And as a final note on our two-year birthday, I want to extend my sincere thanks to Smashwords authors, publishers, readers and everyone else in this wonderful business of publishing who honor us every day with their trust and support. 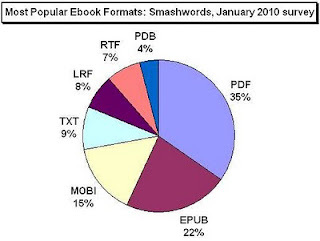 Which ebook formats are the most popular? Once year ago, we tackled this question in my post, Why Multi-Format Ebooks Matter, by analyzing about 50,000 Smashwords downloads. 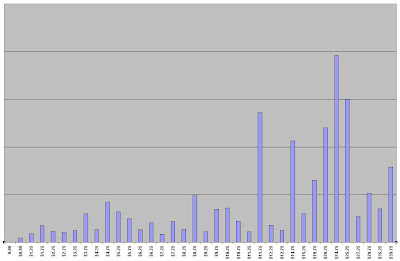 In preparation for my Ebook Revolution presentation with Dan Poynter this Saturday at the The San Francisco Writer's Conference, I decided to do an update on the survey, this time analyzing a Smashwords sample of approximately 100,000 full ebook downloads from January 1 - 31, 2010. For last year's survey, we were pleasantly surprised how handily EPUB beat out PDF. The results this year surprised me again. I incorrectly assumed PDF would drop further from its #2 spot in last year's survey. Instead, PDF was #1 as the preferred format for 35 percent of downloads. Of course, that also means 65 percent of readers prefer a format other than PDF. I've been preaching for a couple years how I think PDF is a horrible, inflexible (can I say "suffocating"?) format for reading straight form narrative, since it lacks reflowability and therefore doesn't allow the reader to customize the font size, font style or line spacing. Oh, I should note that an author with 30 years publishing experience recently lectured me about how PDFs offer customized font selection. "It's call the zoom button!" he told me. Okay, whatever. If that feature satisfies him, so be it. PDF is the one of the best formats for books where layout is critical to the readability and enjoyment of the book. PDF is universally supported on most PCs and many ebook reading devices. While the reading experience may suffer from the aforementioned limitations, at least you know it'll work. PDF is a familiar format. Some percentage of readers still believe that "PDF = Ebook," end of story. We crunched some other interesting data for the panel as well. Interested to know how much customers will pay on the honor system if offered our "Pay what you want" option? How many of them will pay? At what prices will an ebook earn the author or publisher the greatest total sales (price * units sold)? I'll reveal one of them tomorrow, and will save the other as an exclusive treat for attendees at the San Francisco Writer's Conference. The popular (and sold out) San Francisco Writers Conference kicks off next week. Dan Poynter and I are sitting on a panel titled, "THE EBOOK REVOLUTION: How eReaders are Transforming Publishing." The panels starts at 9:00am on Saturday, February 13, and is moderated by literary agent Ted Weinstein. If you're attending the conference, stop by and say hi! I'm looking forward to working with Dan again. Last May at the IBPA's Publishing University in New York, Dan and I co-presented the P-Books to E-Books Session (click here to view the slides on Slideshare). Dan's a true friend and mentor to indie authors and publishers everywhere, and paved the road for many of us. His best-selling book, Dan Poynter's Self-Publishing Manual, has helped thousands of authors raise their game and become professional publishers. The book was my first exposure to the world of self-publishing in 2002, three years before I started writing the business plan for Smashwords. Check out my exclusive interview with Dan Poynter, which appeared on the Smashwords blog one year ago. Despite the dramatic changes in publishing in the last year, Dan's advice reads like divine prophecy. The interview is as current today as it was then. Smashwords is an official sponsor of the San Francisco Writers Conference. Each SFWC attendee will get to wear our super-cool Smashwords lanyard around their neck. We're also sponsoring, for the second year in a row, the lanyard at the O'Reilly Tools of Change conference that kicks off February 22 in New York. Predators & Editors, a service dedicated to helping authors navigate the shark infested waters of book publishing, conducted a reader survey poll last month across a number of different categories, one of which was "Best E-Publisher." Smashwords scored #6. Not bad. Next year, maybe we'll win. Special thanks to Smashwords author Rita Hestand for nominating us, Rebecca Vickery for telling me about it, and everyone who voted for us! 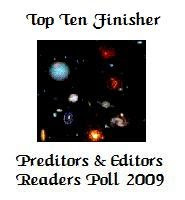 If you're not familiar with P&E, check out this post I wrote December, 2008 (boy, how time flies), Three Websites Help Indie Authors Stay out of Harm's Way, where I reviewed Predators & Editors, Piers Anthony's Internet Publishing Survey and Victoria Strauss' Writer Beware.